Please let me know if you are interested in participating in the Crossfit for Hope event for this weekend. Wear your shirt! if you don't have one they are $15. This weekend is the Crossfit Hope Fundraiser workout!! Beginning at 8:am going until noon this Saturday at CrossFit Roseville we will be hanging out and cheering each other on during this 17 minute workout. Please mark your calendars and plan to make a small donation. We usually recommend $25-$50, but any donations will be accepted for participation this year. 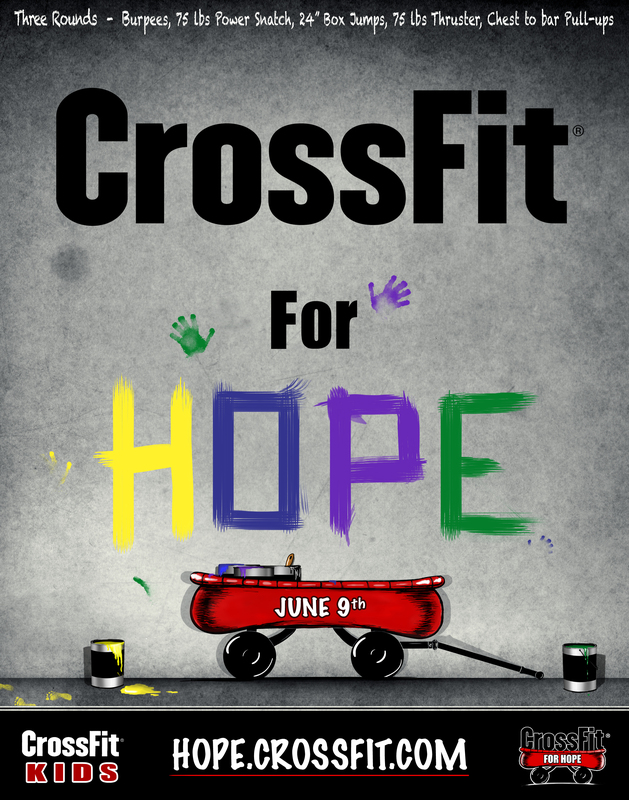 You can donate at hope.crossfit.com with your open login if you competed in this years open or create a login if you did not. You can select CrossFit Roseville As an affiliate and donate to help us raise $1,000 for the event. We will have signups for the Hope workout on the whiteboard. Invite your friends and family to come do the workout to support a good cause! There will be scaled versions of the workout for everyone to try. This is a great way to show your friends and family what CrossFit is and the strength of the CrossFit community. CrossFit Loomis will also be attending the event to bring a lot of energy and excitement to this event! This will be a fun family event. We will provide a main entree. Bring your family and a side dish & drinks.